I am a huge fan of this site and deeply appreciative of the quality of the advice and insights to be had here on the wiki and in the forums. I agree with, and follow, Boglehead principles the best I can with my own finances, but my grounding still references my time logged entering basic financial plans. I find myself disagreeing with (or maybe 'not quite aligning with' is a better way to put it) some of the commentary here sometimes. Given that, I would like to test and improve my take against the best advice of this forum. Tier 1: Defined Benefits: SSI, Pensions, etc. I will admit, right off the bat, that I don't have a good place to put real estate (personal or investment) into these Tiers. If you have a good idea, let me know. Full disclosure, my wife and I rent, so we see housing as a monthly/yearly cost. What makes my take slightly alternative are twofold. For point 1., maxing out Tiers 0-3. If someone tracks their savings and budget, maximizes their income, properly takes advantage of SSI and any Pension available to them, and maxes out (again, to the best of their income) their 401(k)/Roth IRA options into a Boglehead set of index funds and takes some advantage of the unique features of US Government Savings Bonds, almost ANY problem they might have in a taxable account (ie. they owe taxes on dividends, they were not quite Boglehead in their asset allocation and over-invested in a sector fund, their ratio between Bonds and Equities leaned the wrong way) comes under the heading of "problems you'd rather have" in that the foundation of their retirement savings remains fundamentally secure. For Point 2., I am very wary of the Tax Tail wagging the Dog of Overall Financial Health. When I was running reports, I can't tell you how many questions came in related to paying less taxes from folks who were WAY sub-optimal on their basic financial health. My Tiers are oriented around the concept of, first, do everything you can to make sure you maximize the security of your financial plan. I see significant risk to making tax minimization/avoidance a priority that somehow creeps into a concern that is greater than common sense management of your overall financial health. For example, someone who has filled in Tiers 0-4 to their capacity, and who wanted to build a dividend income stream in their taxable accounts with high dividend stocks would likely generate a sensible outcome so long as they understood the tax consequences and stuck with their plan. I don't think it should by default be stigmatized or ruled out as an option, since, in my view, it's a valid approach that might well deliver results that most here would find acceptable, especially in context. Thanks for reading, I'm very fine with disagreement. I may well become more orthodox the longer I read and learn here. 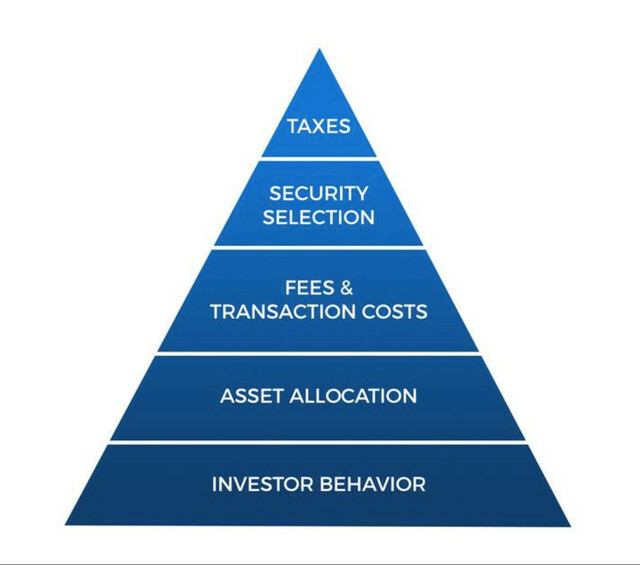 Your post reminds me of a “Hierarchy of Investor Needs" discussion last year. The article being discussed had this pyramid. The key takeaway is that one needs to focus on the things at the base of the pyramid, the upper level items are much less critical. I don't actually see all that much difference in what you suggest here than the typical advice given out on this board. The first question to a new member here nearly always center on income and debts before considering investments. The difference may be that we get relatively few people posting here who don't have Tier 0 basically figured out. Most have also taken advantage of Tiers 1 and 2, even if they may not be optimized. Many of the Portfolio Questions come from these levels. Given that most of the participants of this forum either have, or will have after a short period of time, tiers 0-3 taken care of, that leaves the flexibility of tiers 4-5, as you say, to develop most of the conversation around here. I think the long-term growth of equity investment dwarfs the tax advantages of US Savings Bonds and the like. Definitely agree that human capital and personal financial behavior is incredibly important, though. I'd also throw in having an adequate emergency fund - not only can it deal with otherwise-catastrophic emergencies, but having more than enough in your cash accounts has been shown to be a significant quality of life improvement. Tier 1: downside risk management. Insurance (term life, own-occupation disability, home/renter's, auto, umbrella, medical). Emergency fund. These responses are all super helpful and let me understand that I'm pretty close to aligned!! 1. Spouse and I follow our allocation glide path and the market has a major downturn proximate to our goal retirement year. Third, allow yourself upside exposure/enjoyment while having a plan to cover first and second. Thank you to everyone. My post was too long. Appreciate your engagement.